The large intestine is also known as colon in the human body. It stores waste products before excretion, which is very important function of the digestive system. The condition of ulcerative colitis leads to the inflammation in colon, which disturb the excretion process and affect the body’s metabolism. The inflammation or ulcers originates on the inner linings of the colon, which is very painful obstruction for passing of stool. This problem can lead into severe rectal bleeding, abdominal pain and diarrhea. The problem can enhance and convert into chronic condition, which can last for years. The experts believes that ulcerative colitis probably occurs due to abnormal activity of the immune system which acts on the intestines, but the actual cause of ulcerative colitis is not known. Immune system malfunction can be the other cause, when it is fighting against virus or bacteria, it can attack the cells of digestive tract due to an abnormal immune response and can cause ulcerative condition. Heredity is the major cause, if parent or sibling are affected by this disease the chances of ulcerative colitis in that person is more. But in many cases of ulcerative colitis there is no family history observed. Stress and diet can aggravate the condition of ulcerative colitis but they cannot be the causing factor of this disease. May be the reason in some cases to worsen the symptoms when someone having it. The care pack of Planet Ayurveda provide a best collections of medicines can be the treatment of various types of ulcerative colitis. This pack possess the special herbal remedies like Pitta balance, Vatsakadi churna, Kutajghana Vati and Arjuna, which are known as most effective herbal remedies for ulcerative colitis. These are known for healing the colon and provides relief against the conditions like pain, diarrhea and inflammation. Pitta is the body’s energy, which is responsible for proper digestion, metabolism and converting the complex molecules into the simpler ones. So to maintain the body’s proper metabolism in ulcerative colitis, the control on pitta and agni is very important, to avoid the burning sensation and bloody diarrhea. The product Pitta Balance consists of various pistis like mukta and prawal pisti in combination with giloy, which makes this formulation helpful to balance pitta and reduce the symptoms of ulcerative colitis. Arjuna capsules can be used as a dietary supplement and are very effective against the increased cholesterol, high blood pressure, heart problems and triglycerides. The bark extracts of arjuna tree is used to prepare these capsules. The antioxidants of arjuna is helpful in removing the toxins from the body. It helps in maintaining proper metabolic functions and staying healthy. The bark of arjuna bark is rich in zinc, copper, calcium and magnesium. This also possess the properties of anti-dysenteric and anti-inflammatory. Vataskadi churna is made up of the best quality of vatsak and also contains bilva, saunf, elaiachi, dhaniya, jayaphala and anar in it. These all herbs in combination leads to the formation of a potent remedy to reduce the symptoms of ulcerative colitis. These symptoms can be burning sensation, diarrhea, abdominal pain and also is helpful in improving the functions of intestines. It is helpful against the constipation, improves digestion and bowel movement. It also prevent diarrhea. The extracts of Kutaz herb is used in the formulation of Kutza Ghan Vati, which is very important remedy against the problem of ulcerative colitis. This medicine is useful for the problems like diarrhea, dysentery, bowel syndrome and ulcerative colitis. How to take these medicines? Arjuna Capsules: Take 2 capsules twice daily with water after meal. Kutazghan Vati : Take 2 tablets twice daily with water after meal. Vatsakadi Churna: Take 1 tablespoonful twice daily with water after meal. Pitta Balance: Take 1 capsule twice daily with water after meal. The most effective herbal remedies for ulcerative colitis are explained in the present article, which are the formulation of Planet Ayurveda. 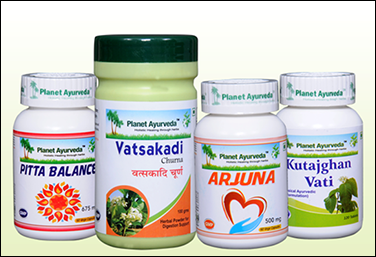 Planet Ayurveda offers variety of health supplements for various diseases, which can be helpful for living a healthy life. The vast product range with the assurance of 100% natural and pure products, has led Planet Ayurveda to be world famous. The products are formulated in completely hygienic conditions, with the complete quality check measures. Planet Ayurveda is a world famous company in Ayurvedic medicine, we are providing our services to many foreign countries. There is a vast range of health supplements and herbal remedies can be useful for the treatment of various diseases. We believe in Ayurveda and want to make world disease free.